Who says the great outdoors isn’t made for luxury living? 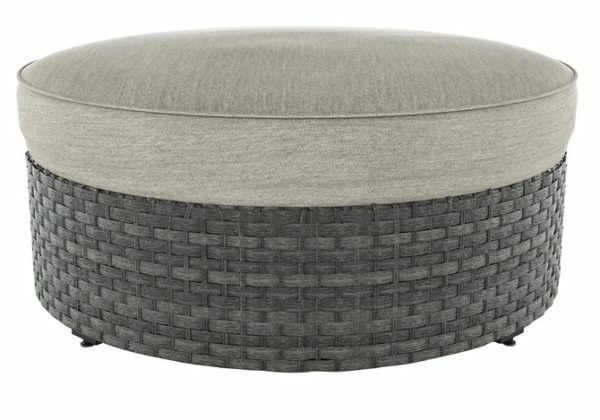 The Spring Dew outdoor round ottoman with cushion offers all high-end design, plush comfort and durability you could ask for, and then some. This outdoor ottoman’s round profile beautifully goes with the flow. All-weather, rust-proof aluminum frame provides the easy-breezy wicker look you love without the high maintenance. Rest assured, the high performing Nuvella™ fabric is made to stand up to the elements. For indoor or outdoor use. Cushioned resin wicker modular seating. 6 throw pillows included with 7 piece sectional set. (2 pillows with P453-077 and 4 with P453-877.) To order 7 piece sectional set, order P453/077/846/877. 2 throw pillows included with curved corner chair P453-851. Cocktail table has wood look resin top. Welded rust free aluminum frames. High performance Nuvella fabric. Collection includes a variety of modular seating options. Also available in Brown under Spring Ridge. Corners: 34” W x 33”D x 26”H. Square ottoman: 30” W x 30”D x 17”H. Cocktail table: 30”W x 30”D x 17”H.